The latest ZERODATE wireless gaming mouse, with 3 buttons Fluent hands with a common design feel comfortable. Ergonomic surface to reduce hand fatigue, this mouse will make your game experience more enjoyable. ZERODATE T16 with ultra durable design,5,000,000 clicks lifespan. 2.4GHz Wireless provides with a powerful and reliable connection, increases working distance of up to 10m. 2.4G wireless transmission allows working distance of up to 10m. Wireless mouse photoelectric sensor using a more advanced technology, the mouse is sliding and fast. and. Plug and play, compatible with Mac and PC. The USB mouse design offers you comfortable grip. Rubber scroll wheel is easy to scrolling up and down. ZERODATE T16 2.4G 1600 DPI wireless portable mobile mouse with 1600DPI high-definition optical sensor. 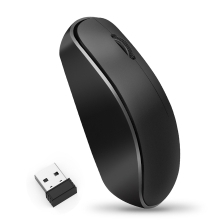 Provides with a new NANO wireless receiver stored within the back of the mouse. Ergonomic surface to reduce hand fatigue. The mouse with textured sides, which makes it fit your hand perfectly and securely. Fluent hands with a common design feel comfortable. Support System: Windows 98 / Me / 2000 / XP / Vista / Win 7 / Win8 /10/Vista Mac OS or latest.